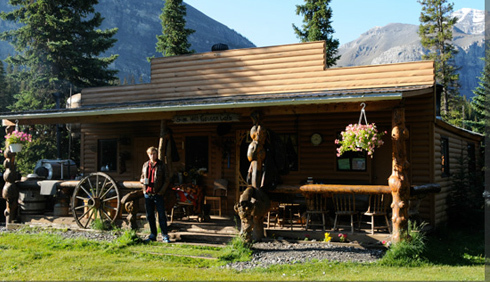 For more than 30 years, The Outpost at Warden Rock has been leading guests on mountain horseback riding, dude ranch and stagecoach adventures into the majestic Canadian Rockies, bordering Banff National Park. Western horseback riding vacations include 2-6 day all-inclusive Horseback, Stagecoach, and Bring Your Own Horse (or Mule!) Holidays. 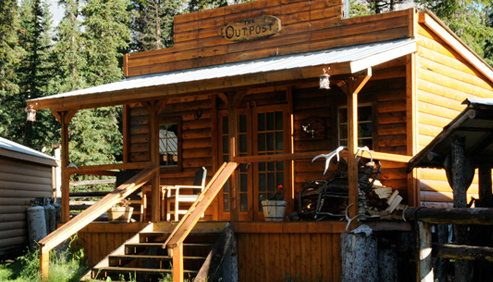 The Outpost's remote backcountry lodge is located 50 miles north of Banff and a little over 50 miles west of Sundre, Alberta. 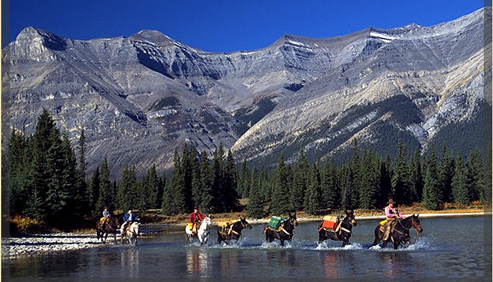 Riders and non-riders enjoy Banff horseback riding holidays, hiking vacations, Wild West Spa Escapes, all inclusive bring your own horse or mule riding vacations, stagecoach trips, corporate retreats and equine educational holidays to learn Tack Fitting, Packing and Driving Teams. Vehicle access is restricted in the area where guests ride, meaning there's no traffic and you can literally ride back in time to discover mountain scenery and adventure. 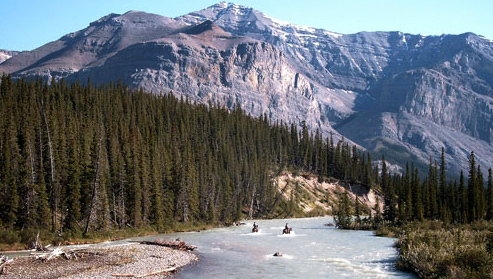 The Outpost sits on 12 acres, between the historic and protected locations of Banff National Park and The Ya Ha Tinda Ranch, home to more than 150 horses used by Parks Canada wardens and researchers in each of its mountain parks. Ride to breathtaking mountain views in wide open spaces! 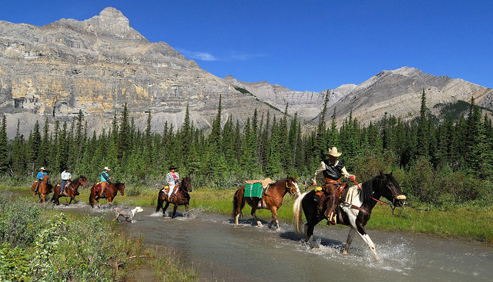 Horseback Adventure Package 3 up to 6 days- Ride horses in the scenic mountain prairie grasslands of the Ya Ha Tinda Ranch and the Rocky Mountains bordering Banff National Park. 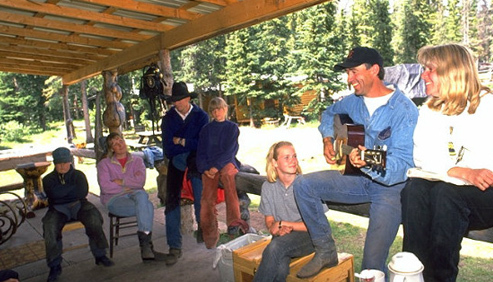 Wildlife and Heritage Retreats- Interpretive Alberta Horseback Vacations and Dude Ranch Vacations exploring the region’s unique culture, history, wildlife, landscapes and ecosystems. Mile in Style Package- For more experienced riders who want to ride gaited horses! Chicks in the Sticks Women Only Riding Vacations- Organized Hike & Cowgirl Boot Camp session, guided horse rides, yoga, pilates and more! 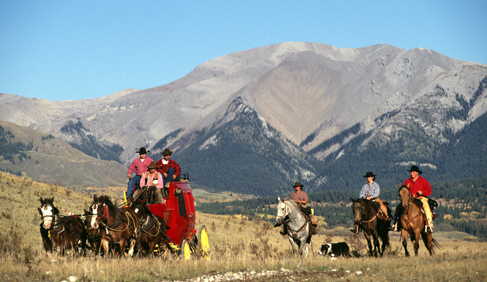 Bring Your Own Horse Vacations- Equine camping holidays or bring your horse to ride the Rockies and stay at The Outpost in comfy cabins with gourmet ranch style meals. 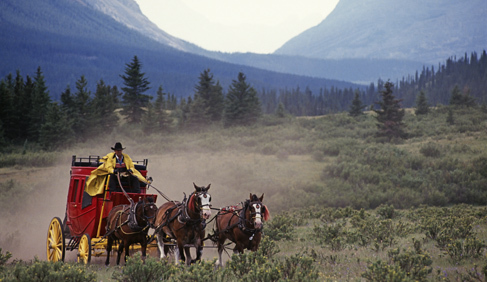 Equine Educational Holidays- Learn to Drive Multiple Hitches, Wilderness Packing School, Gaited Horsemanship Clinics. 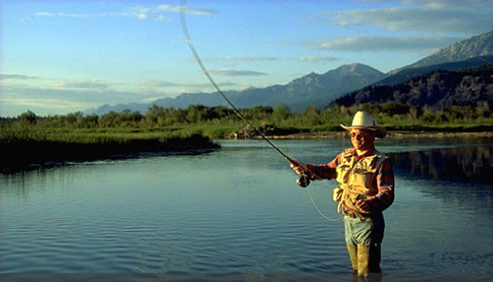 Corporate Dude Ranch Vacations and Group Equestrian Vacations- Bring fellow workers, family and friends. Click here to see dates, rates and pricing for these riding holidays. Working stagecoach rides, horse riding, hiking, equine clinics, mountain biking, hot tub, horseshoes, fishing, campfires, fresh air and fun! 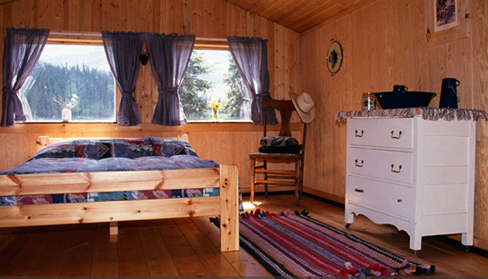 A rustic, backcountry lodge and fully furnished cabins with most of the comforts of home in a stunning, remote location along the banks of the Red Deer River. The lodge is heated by a large wood-burning stove and lit by kerosene lanterns. Large ceiling windows invite guests to relax and enjoy a panoramic valley view and the stunning peaks of the Canadian Rockies of Banff National Park. There is hot and cold running water in the main lodge and a telephone. Guests stay in cabins with warm, wood-burning stoves, kerosene lanterns and candles and hand-made duvets. Gourmet, country home cooking and hearty meals. Plenty of coffee and home-baked goods. 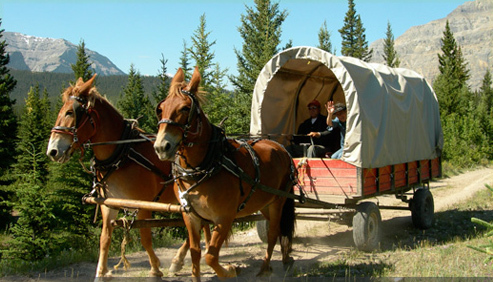 Lunch may be taken on the trail, out on the chuck wagon, in the lodge, out on the deck or by the fire pit. Banff National Park and the mountain town of Banff. 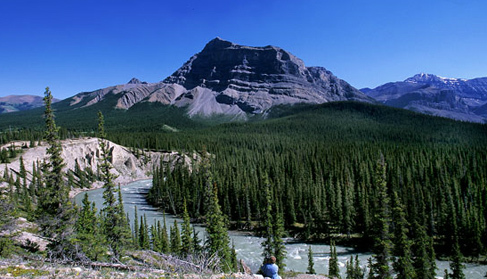 Nestled in the majestic Canadian Rockies, bordering Banff National Park. 2.5 hours drive from Banff and Calgary. 4 hours from Edmonton. Checks, bank drafts, and money orders in Canadian funds. Visa, MasterCard and American Express. Travel Agents Accepted- This outfitter works with travel agents!